Well, here I am again, starting out as a Teeny Tiny Baby Pony. I have twice lost my ID in the 20+ years that I have loved the MLPTP. I was a member back in the day and I've again found my way back. 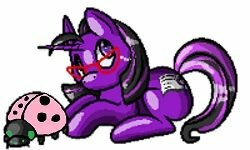 I recently visited with my old friend, Twinkler, AKA ThePonyRoom and I'm inspired to return to collecting. Perhaps not the best time, as I'm unemployed, but I need the joy back in life. I'm in Toronto visiting my home and half my collection. Unfortunately, I've had some devastating pony news, I'm not sure how or when, but it appears that a large chunk of my collection has disappeared. When I return to Vancouver, I can confirm how great the loss, but it seems all my TAF's, TE, Princess Ponies, and Rainbow ponies are among the loss. It's possible some of my original ponies are also missing - Seashell and Bubbles. I've been very upset over the loss, especially about the missing originals, as they cannot be replaced. However, I will rebuild. Anyway, greetings pony friends old and new! I'm so sorry for your loss. That is such sad news after having them with you for such a long time. I don't have any of my original collection. I have nearly re-collected my original collection and can say that there is something really special with those ponies even though they aren't the actual ones that were mine, I still identify with them as if they were. You may be surprised when you are re-united with the not-quite-yours pony, you might feel just like each one was yours anyway. They're like a beautiful ghost of the pony you had. Cactusflower, why does that sound familiar to me? Did you use that user name before? Why is that name in my head? Okay well anyway....(don't say it is because I am a Texan) ROFLOL. I am an older collector also. I am so sorry to hear about your loss of ponies. This is tragic news. I have a lot of extras girls I need to get rid of at some point. My pony situation is busting at the seams over here. I am so sorry to hear of your loss. That must be a devastating blow, especially for all your originals. ;_; I hope you're able to find all of the ponies you've lost. Welcome back, that really stinks about your missing herd. You can always replace them though, little by little. If some of them were childhood ones that's a little sad cause I know it makes them special but hopefully they'll turn up.